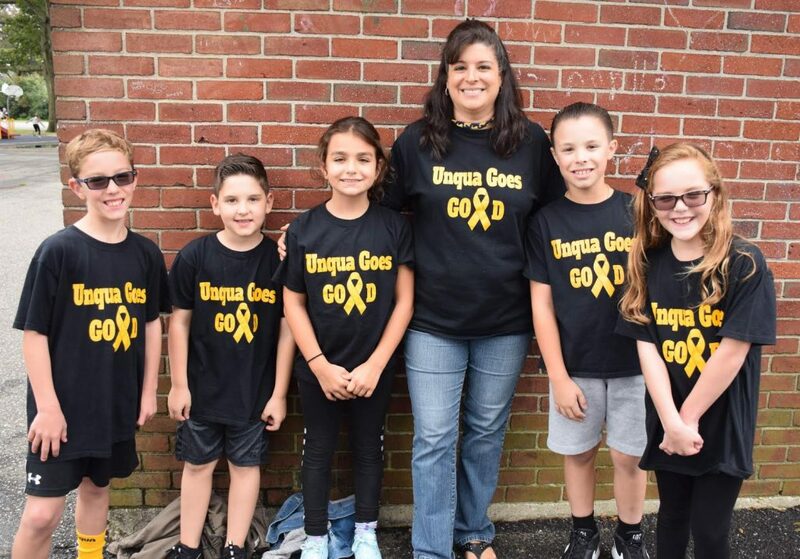 To mark Pediatric Cancer Awareness Month in September, Unqua Elementary School in the Massapequa School District held Go Gold Day on Sept. 28. Students and staff wore combinations of gold, yellow and black. Every year, the school raises money for causes that benefit children. For its first fundraiser of the 2018-19 school year, Unqua students were encouraged to donate $1 each for Infinite Love for Kids Fighting Cancer, which supports childhood cancer research. The organization was founded by the parents of a 3-year-old girl who was diagnosed with high-risk lymphoblastic leukemia, and ultimately survived. Unqua students donated nearly $350 to the cause. Photo Caption: Unqua Elementary School orchestra teacher Alison Pearl and fourth-graders, from left, John Thomas, Nicholas Passanante, Olivia Greco, Michael Pasquale and Grace Thomas were among those who wore black and gold in support of Pediatric Cancer Awareness Month.